Notes: 1 silver albumen print; 21 x 26 cm. Notes: Architects: Machinery Hall -- Henry Pettit & Joseph M. Wilson; Judges' Hall -- H.J. Schwarzmann; Pennsylvania Railroad Office -- Joseph M. Wilson; World's Ticket Office -- H.J. Schwarzmann; Centennial Photographic Association Building -- H.J. Schwarzmann. Notes: Artist of the "Washington" monument is M. Dickerson Eyre. 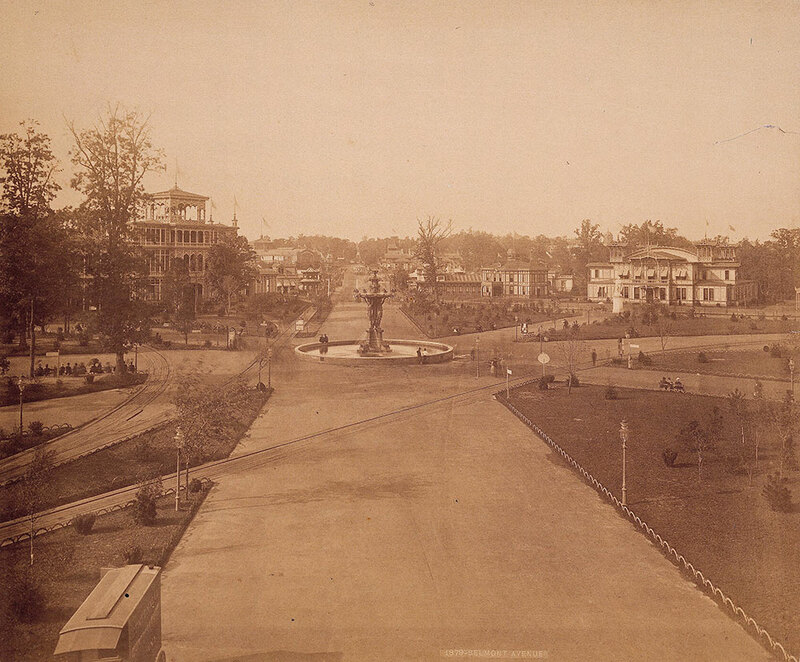 Notes: Belmont Avenue with Bartholdi's Fountain prominent, lamp-lined walkways, landscaped grounds, the Washington monument and pedestrians, and several buildings, including Machinery Hall, Judges' Hall, Pennsylvania Railroad Office, Frank Leslie's Pavilion, World's Ticket Office, and Centennial Photographic Association Building. Notes: Title on label: Belmont Avenue.